Joseph Cardinal Bernardin, the archbishop of Chicago, had long been considered the leader of American Catholicism and was so widely respected throughout the world that he was thought to be the only American who might become Pope. His life took another path, however, after he was falsely accused of sexual abuse in 1993. Vindicated and about to embark on a broad program of renewal, he was stricken with pancreatic cancer in 1995. His destiny, as those close to him soon sensed, was not to become a Pope but a saint instead. Between his first diagnosis in June 1995 until the recurrence of his cancer in August, 1996, a period of fourteen months elapsed. There are fourteen stations in the traditional Catholic devotion of the Stations of the Cross that commemorate the events from Christ's judgment through his carrying of his cross to his crucifixion and death. In the last months of his life, Joseph Bernardin lived out those stations in his own life, from being judged unjustly by the high priest brother Cardinals who wanted to eliminate his influence in American Catholicism, to his bearing in his own cross, and from his last meeting with his mother to his public death, Cardinal Bernardin reproduced the passion and death of Jesus in his own. 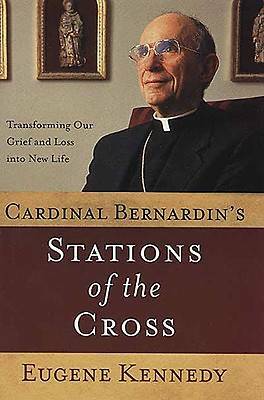 This book is a series of meditations on the traditional stations, based on scriptural scholarship, and the stations Bernardin lived, revealed by the author, Bernardin's close friend for thirty years.